After chugging up the long road to Taos, the RV pulled into a dirt lot in front of the Two Graces gallery where Robert Cafazzo stood, awaiting his six travel writers known as the “Whiskey Sisters.” He was the first and last man to step foot on our RV with us during the trip. Robert welcomed us to Taos with a stack of towels and took us to a sacred hot springs known as the Llano Quemado ‘Ponce de Leon’ Hot Springs.The Springs consist of five pools, two of which are smaller soaking pools that the four of us bathed in that day. The Native Pueblo people still hold their Sacred Blessings at the special pools. We waded in the warm and gentle waters, bathing us in a turquoise hue. The water remained turquoise from the stones that are left, and that we were instructed to also leave, in thanks. A gentle trickle of of water could be heard in the distance where the water followed us along the trail. While I waded around in the 80-degree blue water, I listened to the Pueblo people cleaning up a section of the trees and landscape beside the spring for a special upcoming ceremony. It was a fitting initiation into our day in Taos. We bathed in the healing waters of this sacred place of turquoise before we began our journey to visit the Pueblo land. 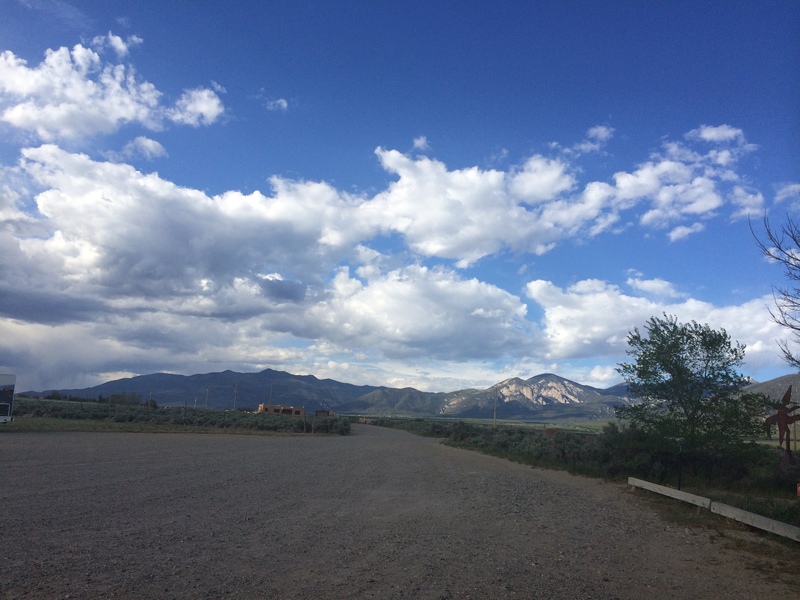 With the sacred mountain to our backs, our little RV clattered and jolted along a long dirt road lined with some of Taos’ most beautiful ranches. 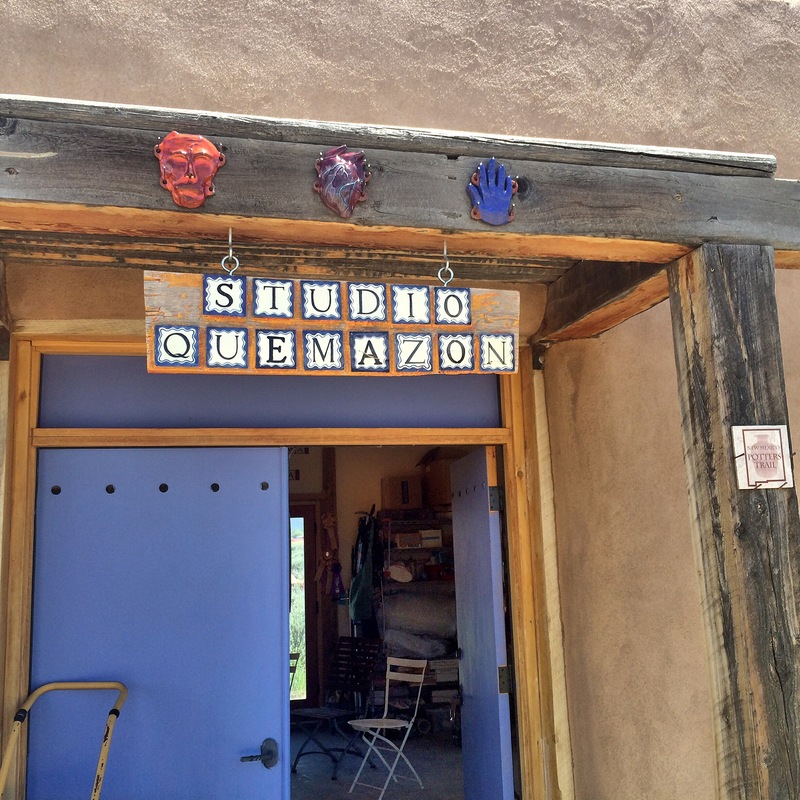 We came upon a wooden entryway to an adobe house that read “Studio Quemazón,” where Deborah Rael-Buckley welcomed us with iced lemon-basil water. Her intricately sculpted art pieces nestled together in the studio, which held the stories of Deborah’s past and her family’s history. The sculptures came up to my collarbone in height and depicted a powerful and emotional story of womanhood. As Deborah explained how she came up with the idea for the dark dress covered in small rhinestones with designs of the constellations in the sky upon it, I began to feel a connection to the dress. She explained how she would have restless and sleepless nights, and how as she would go out into the New Mexico night sky and look to the stars, wrapped in the warm blanket of its darkness. The next sculpture I found to be the most powerful. Swirled waves clasped onto a window pane containing a woman on a stool. Atop the swirled collection of clouds which made up the bosom of the dress, sat a birdcage. A woman, caged. A prominent theme was beginning to develop on our trip – rebellious, free-spirited women are often confined by their history, their future, and society. Often with ideas so big, they don’t always know how to harness and put them into motion. Sometimes, their hesitation or restraint is the people around them, or the viewpoints of the people close to them. Sometimes it is too scary to let these ideas develop, sometimes, they don’t know how to find them. One of the last pieces was on a postcard advertisement for an exhibit. Aliza stared at the piece (which you can see here), for a long time as if trying to make sense of its swirled conclave of emotions and two oars with a cloud on top. When she asked about it, Deborah explained that it had been created just after the death of her father. Aliza’s face immediately sunk with grief. Her own father recently passed away, the month before, in fact. The two women shared a moment in understanding and in pain, in Quemazón. We learned from our docent Deborah Stone that because of O’Keefe’s struggles on the East coast with her lover and then husband Alfred Stieglitz, she needed an escape, a place that was uniquely hers, and a place that Stiegletz and his family, dotted all over New York, had nothing to do with. We heard similar stories of Taos, of how the sacred mountain lures you in, it either holds you there, or spits you back out. Taos can turn even the non-believers into artists. That’s what Nita Murphy, co-author of “Millicent Rogers: A Life In Full” told us. She wasn’t a writer, she didnt know how to write a book, but she had a story to tell. Millicent Rogers was known as the beautiful, wealthy socialite, who married three times. She was constantly searching for beauty in the world around her, in the clothes she wore and in the people she surrounded herself with. Millicent is also famous for the men she loved. In fact, she ended up escaping to Taos completely after she found her lover, Clark Gable in the arms of another woman. After a trip to visit friends in Taos, Millicent would forever be enchanted by the open space, in the sacred shadow of the Taos mountain that she would also call home. 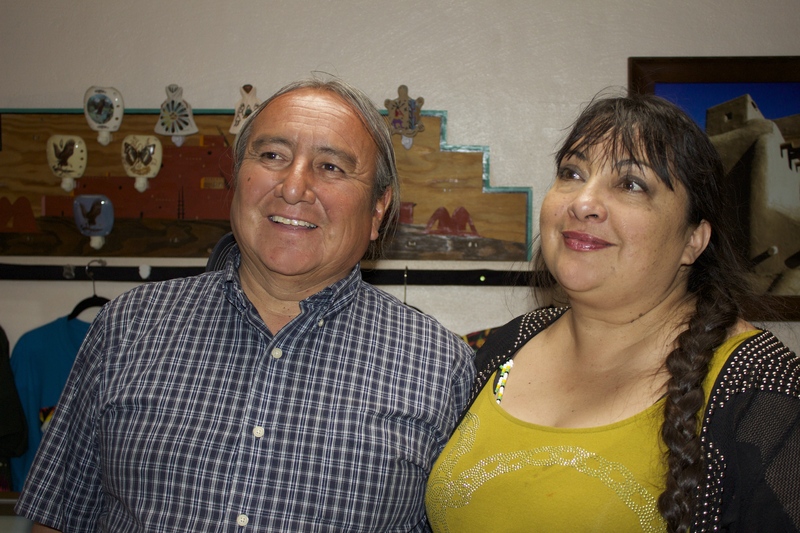 Next we visited the Taos Pueblo, where we met Mary and Esther Winters, and designer and contestant on Season 11 of Project Runway, Patricia Michaels at the “Cafe Adobe.” They told us about how they had acquired the building from their great aunt. 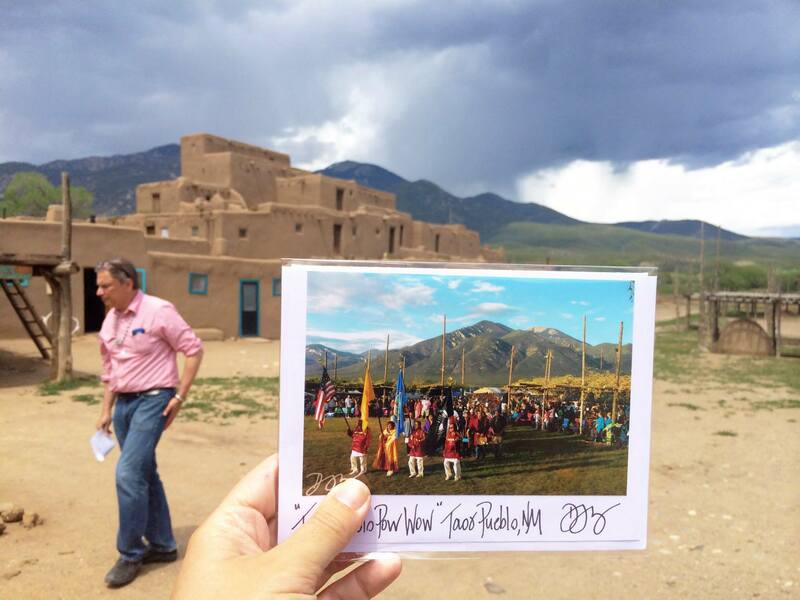 The Taos Pueblo has been inhabited for over 1000 years now, and is considered to be the oldest continuously inhabited community in the USA. While they cooked up a variety of lunch options to share with us, including the “Hunter’s Wrap,” made with fabulous green chile, we sat on the patio and chat with local tribal officials including Pat Romero. They explained to us their programs to educate the public and incoming teachers to the about Pueblo kids. “I can’t understand why this child won’t look at me when I talk to him!” A teacher explained to him once. He explained that that is just the way of the people, and that she should not be insulted. Their land, ancestors and culture existed in North America long before the Europeans came. I’m sure I would have never made it in the Pueblo community hundreds of years ago. 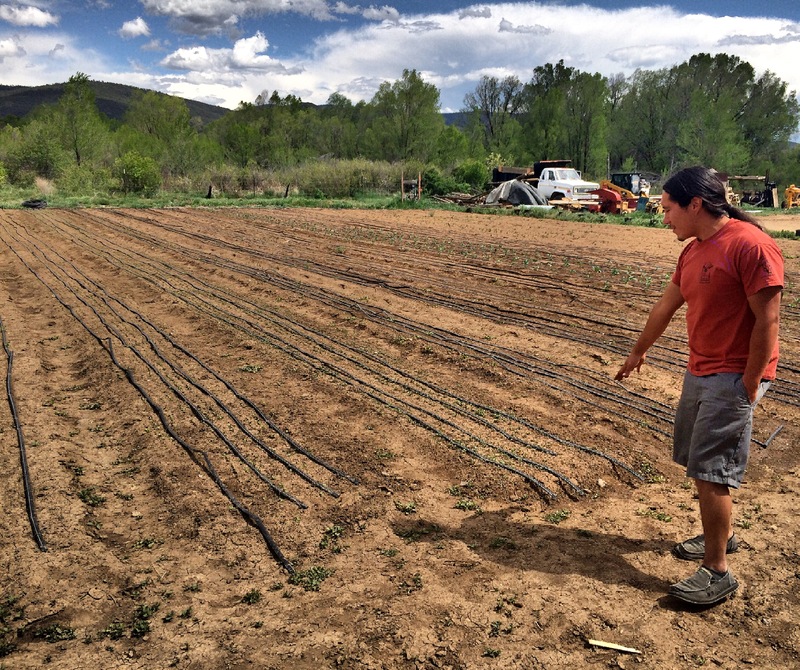 Our next stop was the Taos Pueblo Red Willow Farmer’s Market where we met with Angelo McHorse, Red Willow Farm manager. He told us about this project for local kids he started after going to school in Colorado and then coming back with an Ag business degree. The farm uses innovative sustainable technology which celebrate their traditional agricultural heritage with modern food production, Angelo told us. Within their three green houses they are able to produce vegetables year round. 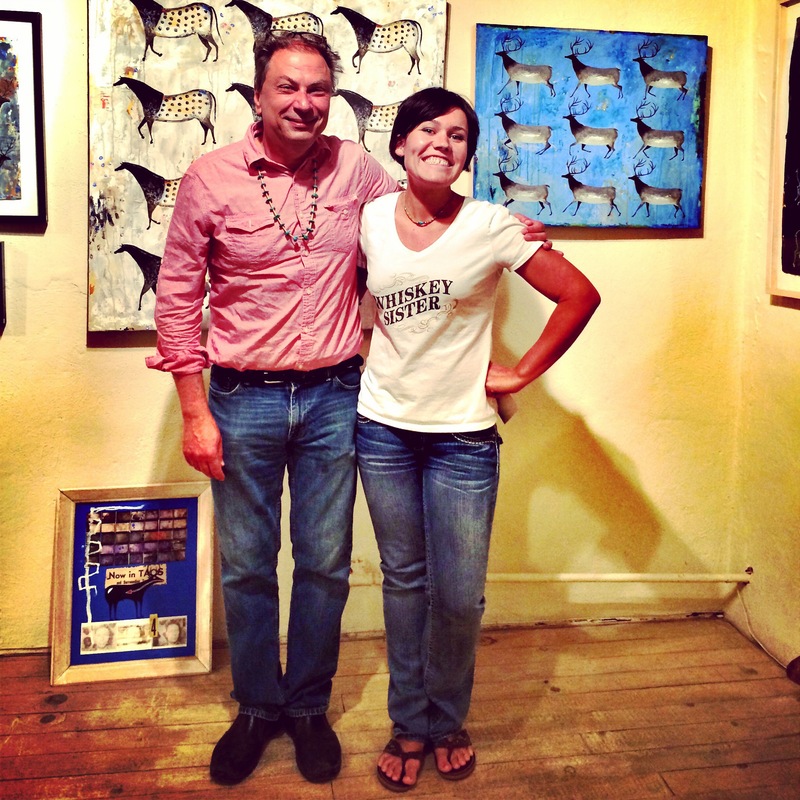 Taos is a town for artists. It is also very typical New Mexico and is rich with the local Native American influence. If you have never felt any sort of spiritual connection with the land and gift of nature before, you probably need to visit New Mexico. As you stand at the foot of the great mountain, amongst the streams and springs or vast grassy fields (one of which holds the Pueblo buffalo herd), its impossible not to be enchanted by nature. You couldn’t possibly hope to see everything Taos has to see in a day, so if you have the opportunity, stay longer. Our historical trail of badass women of the West was certainly best ended in Taos, the highlight of our trip. Robert, our guide, meticulously prepared and graciously welcomed us to Taos for our one-day visit. In no other city that I contacted did anyone reach out to us with such enthusiasm as Taos. I left ready to slip into a flowy turquoise skirt and whip out an easel to paint the high desert sky. Is it something in the water, or maybe the sacred mountain had already lured us in? In fact, all of the Whiskey Sisters were ready to move there, each one inspired in her own way, and each us of re-inspired by each other, as strong women. Very interesting writing, Kaysha. I thoroughly enjoyed it.